This page will have tips and helpful hints. Check back often as I will be adding items frequently. New tips are posted at the bottom. What chain do I want to use on my ATV? Chain, chain and more chain. Almost all ATV's require driveline chain. Many people have chain problems that are usually caused by one of these items. In order to limit chain problems one must make sure all the above items are in good repair. The chain adjusters are of upper most concern, as they are of questionable quality in some older machines. In order for chain systems to work correctly; they must be running "true" in respect to the sprockets. Sprockets must be in good condition with no major wear. Axles must be "true" with good bearings to prevent unwanted movement. The machines frame must be in alignment and capable of holding all the parts firmly. All chains themselves must be in correct adjustment, clean and lubricated properly. The machine must be kept clean inside, free of rocks and other items that will get into the chain and sprockets. Chain quality varies considerably. A person can purchase cheap chain from discounters or farm stores, or one can buy good quality chain from Industrial supply houses. This is a true case of "you get what you pay for". I have seen cheap import chain priced from 15$ for a 10' roll of #50 chain. I would never install this inferior quality chain in any ATV. A example of a good chain is US TSUBAKI which can be purchased from Graingers or most any other industrial or bearing store. However: it is priced much higher. Good quality chain requires fewer adjustments and is stronger, since the chain stretches less, your sprockets will not be worn out as fast. O-ring chain is nothing but standard chain that has rubber O-rings installed inside the connector plates. The primary function is to keep factory lubrication inside the rollers and to keep dirt out of the chain. Most O-ring chain is of excellent quality and a good idea for ATV'S. Installing O-ring chain into machines that were not designed for O-ring chain can cause problems. O-ring chain is much wider than the standard chain it replaces. This will cause clearance problems in many machines. Sometimes these problems will stop you from using this new chain. For example a person can not install O-ring chain into older MaxII machines because the clearance problems. Out of the 8 chains on a Max II there is only room to install O-ring chain on the trans to jackshafts. Be sure to check your clearances before you buy lots of O-ring chain. This question comes up all the time, Upon restoring a ATV many people want to know if they can install a electric fuel pump instead of the pulse pump originally installed. The answer is NO, not under any condition. Why: The carburetors that are used in most all ATV's require only about 1 PSI to operated the float. If one installs a electric pump then you will have about 5 PSI, which will flood the carburetor. If this is left unchecked the fuel will overflow and perhaps catch on fire. This happens a lot, Check out this red ARGO 6. Another problem is a electric pump will not stop running until the switch is turned off, where as a pulse pump will stop when the engine stops. What Tire do I put on my AATV? Tubeless, very sturdy. Hard ride but very resistant to puncture and other tire damage. Aggressive tread gives good traction in all conditions, excellent water speed. The Goodyear Rawhide III does ride somewhat smoother and is one inch larger. Older machines with small axles should be very careful as these hard tires will perhaps allow the vehicle to bend axles and send too much shock to the body. All these tires mount on a 8" rim. Tire dimensions are about 21x11x8. 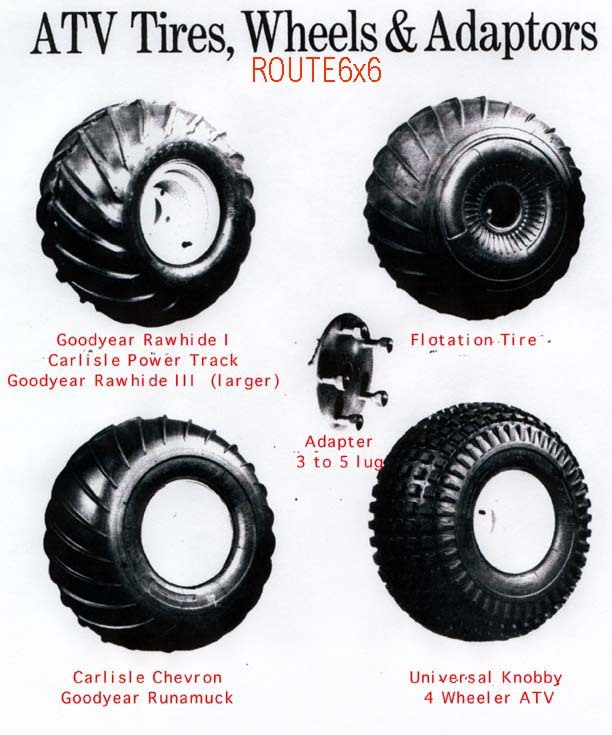 The Rawhide style and Power Trac are the only tires that can be used with most tracks. (except ARGO'S see below). ROUTE6x6 and RICHARD's RELICS now stock all wheels and tires at reasonable prices Contact: Richard Clark 812-944-1643 Noon-6pm EST Weekdays or by email. Tubeless, relatively fragile. Very soft ride, really smoothes out the bumps! If you have a sore back these are the tires for you! Also if you have a machine with small axles or a brittle body these tire will transmit the least shock to the body (modern tire wise). These are the standard type of tires for ARGO's. If you have a ARGO and want to use tracks you must use these tires. These tires are easy on the ground as they are not very aggressive. Tire dimensions are 22x11x8". They also mount on a 8" rim. 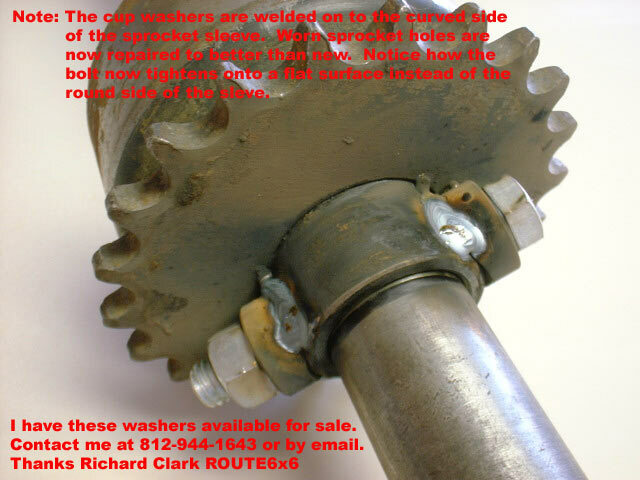 ROUTE6x6 and RICHARD's RELICS now stock all wheels and tires at reasonable prices Contact: Richard Clark 812-944-1643 Noon-6pm EST Weekdays or by email. Flotation: Firestone, Goodrich Hi-Flex, Uniroyal and others. Old design one piece wheel and tire combination. Last made about 20 years ago. The tire was glued to a small hub, making the tire combination unrepairable, except for patches and sealer. However they give a VERY Soft ride and overall good traction. Most of these tires used 3 studs for installation. Usually the only ones on the market are used. If you deiced to use these tires be aware that they may last you 10 minutes or 10 years! I have these tires available at times, see RICHARD'S RELICS or email me. If you need many of these I suggest you convert to modern wheels and tires. Some older machines used these tires with their track systems. Which brings us to the next section! Wheel hub adapters allow one to convert from the old style 3 bolt small axle hubs to the modern 5 bolt steel rims. They will bolt on to your 3 bolt hubs but you may consider also welding them on. After installation of the adapters one can then install a standard ATV 5 bolt rim. Of course you will need a tire to go on this rim! I also have adapters and wheels for this purpose. See RICHARD'S RELICS or email me. The adapters come complete with the three holes and 5 studs with lug nuts. I also stock wheel, tire and adapters packages at best prices on the internet: Contact: Richard Clark 812-944-1643 Noon-6pm EST Weekdays or by email. for details. Cheap Tires: Universal Knobby or other 4 wheeler style tires. These tires: if you chose the correct size will work on most AATVs the major disadvantage is poor performance in water. Look out for tire to body clearance problems. An will not allow the machine to skid steer correctly For many reasons I do not recommend KNOBBY tires .These tires are available at most motorcycle or tire discount firms. They are also tubeless and come in many sizes None will allow the machine to skid steer correctly. But my ATV has 12" rims now! What do I do? A few AATVS will have 12" rims (mostly some MAX4's some HUSTLERS and SWAMP FOXES). Tires for these machines usually will look something like the Goodyear Rawhide, only larger. Most will be 25-26" tall. These are really hard tires but they last for years. . ROUTE6x6 and RICHARD's RELICS now stock the large wheels and tires at reasonable prices Contact: Richard Clark 812-944-1643 Noon-6pm EST Weekdays or by email. Heat shields, ventilation tubes or heat deflectors are used on all All Terrain Vehicles to control cooling of the engine. Any engine must have cool air supplied to it and the hot air which is expelled form the engine MUST be ducted outside the ATV body. Only then will the engine have proper cooling. Failure to install these ducts will result in an overheated engine and perhaps a melted body! On many ATV'S the cool air duct is nothing more than a large 8" plastic vent hose. This hose is usually positioned so it draws cool air from outside the ATV and places the air at the cold air intake of the engine. The hot air vent is usually metal and it directs hot air from the engine to the outside of the plastic body. These vents are usually missing on older machines, So if you want dependable performance from your ATV make sure these vents are correctly installed and maintained. If you install a new engine in your machine be sure to remember that the engine must run cool. Let's clean our All Terrain Vehicle! This is not the most glamorous maintenance item, however, it is most important so as to extend the life and enjoyment of your All Terrain Vehicle. Take care to wash off mud and debris from the outside of the vehicle. A clean vehicle will stay in better condition longer and is less susceptible to fading and weathering. Keeping the ATV clean inside as well, is vital to prolonging the life of the chains. Here's why: The chains are in a high-friction environment, thus, keeping the dirt and grime out of the drive train will make the chain and sprockets last longer. Proper maintenance and cleaning are essential. Keep rocks, metal, wood, tools and bullets and shells out of the inside the ATV. Because such items can easily get between sprockets and chain, chances are they will chew up and break the chain, chain adjusters and/or sprockets. 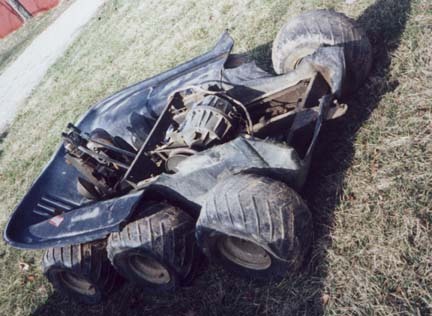 This can be a very unpleasant situation that can lead to a very expensive lesson for the ATV owner, both experienced and novice alike. After cleaning is an ideal opportunity to check the condition of the chains and to adjust and lube them. One idea to help you along with the cleaning process is to use a wet/dry "shop vac." This makes the job much easier than cleaning the machine with your hands! 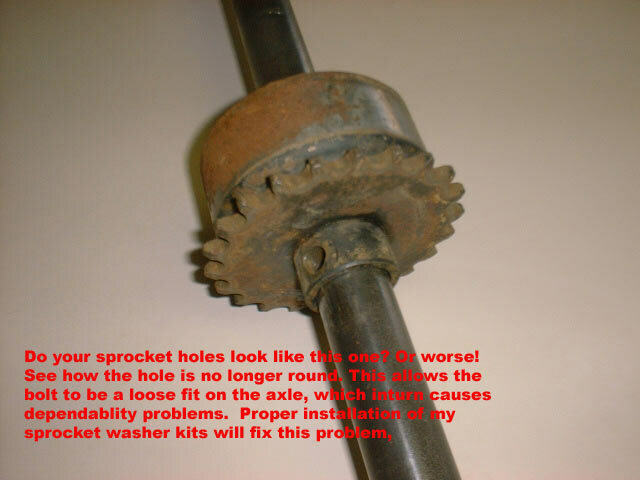 One common problem to the restoration of almost all All Terrain Vehicles is worn sprocket sleeve holes, where the bolt goes through the sprocket sleeve and the axle. These holes get worn and elongated as the rocking of the sleeve on the axle continues. These holes will get so bad as to allow the bolts to break and cause major chain alignment problems. See PHOTO 1. I have developed a kit of sleeve washers to fix this problem. This kit contains two special steel washers which are welded on to the sprocket sleeve. After installation of these "washers" the elongated holes are gone! And another plus is then the bolt is able to tighten on to a flat surface, instead of on to the rounded side of the sleeve. See PHOTO 2. 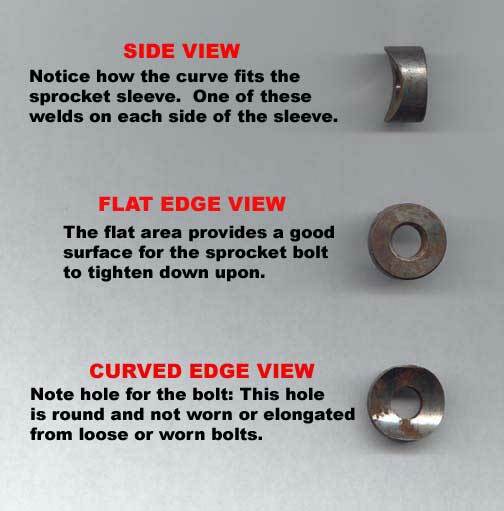 After installation of two of these washers onto each sprocket sleeve. You will have a sprocket assembly which is fully repaired and much better than new! See PHOTO 3. I have these washers available for sale. Contact me: Richard Clark 812-944-1643 Noon-6pm EST Weekdays or by email. give many years of dependable service. shaft along with the outer sprocket shaft including the bearing for support. See PHOTO for details. One should consider updating their T-20, if you have the newer unsupported style. 812-944-1643 Noon-6pm EST Weekdays or by email. The Borg Warner T-20 Transmission has been used in thousands of All Terrain Vehicles, including models of the ATTEX, HUSTLER, MAX, CAMEL, STARCRAFT and many others. Even in some commercial equipment like the HUSTLER WINGIT OFFSET SPRAYER. Many of these T-20's have been in operation since 1969! This Transmission is a wonderful piece of modern engineering. A new or properly rebuilt T-20 will give many years of service. However as with all mechanical items, things do need to be replaced with time. In the past year I have seen a ever increasing number of T-20's come to me for repair with major drum and bearing damage. Almost 100% of this damage is being caused by running the T-20 without the proper level of Automatic Transmission Fluid. WHY? Since many of these T-20's are decades old the real problem is easy to find: PLUNGER SEALS. These seals are nothing than special O-rings that are installed on the four plungers, there are either one or two of these O-rings on each plunger. With the passing of time, these O-ring begin to leak the ATF out slowly. If the owners do not keep the inside of the machine clean, one may not even notice it. These O-rings are very cheap, however: when the transmission is used without proper lubrication the bands soon loose their linings and start the metal to metal wearing on the drums, which in turn send metal particles through out the whole T-20 destroying all the bearings. What all this adds up to is that instead of a 20$ parts bill for gaskets and these O-rings you will have many hundreds of dollars to spend to fix the T-20. The drums are priced at an average of 150$ each and there are 4 of them! What all this adds up to is: BE SURE TO KEEP AN EYE ON THE FLUID LEVEL INSIDE YOUR T-20. I recommend changing these O-rings every ten years. I have available ALL rebuild or repair parts for most T-20's Just check out the PARTS FOR ATV'S section within this ROUTE6x6 web site. The Borg Warner T-20 Transmission has been used in thousands of All Terrain Vehicles, including models of the ATTEX, HUSTLER, MAX, CAMEL, STARCRAFT and many others. Even in some commercial equipment like the HUSTLER WINGIT OFFSET SPRAYER. Many of these T-20Õs have been in operation since 1969! This Transmission is a wonderful piece of modern engineering. A new or properly rebuilt T-20 will give many years of service. However as with all mechanical items, things do need to be replaced with time. THE BAND SURFACE MUST BE REPLACED. Never "turn down" the drums as they will then be too "small" and therefore the bands would be "too long" I have available rebuilt bands, new and used drums all at attractive prices. Email me for details or visit my ATV PARTS website. of these drums be sure to also check the bearing to case surface and the gear ring machining of the "ring drum"
You are welcome to call me on the phone for additional information. 812-944-1643 Noon- 6pm EST Weekdays or by email. With all machines newer or older collectable AATV's. There will someday come time to replace the axle bearings. With a new machine this is an easy job, but with age comes rust and dirt. 1) Clean out the bottom of the machine with hot water and high pressure. 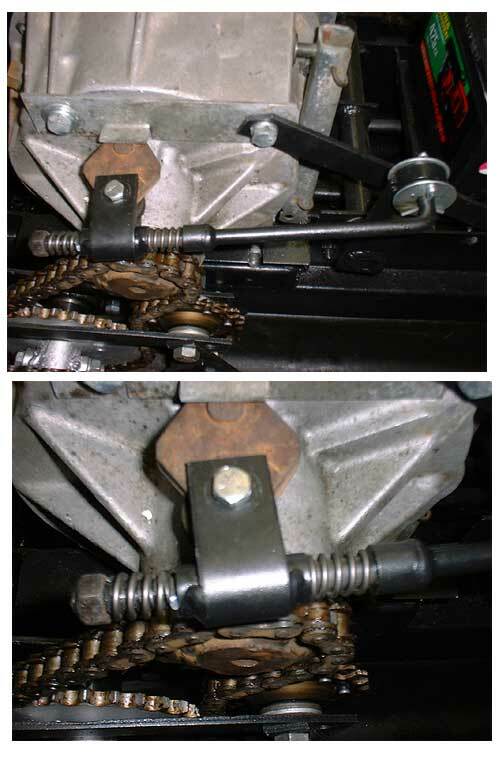 2) Remove all axles to sprocket bolts or pins, do this on all axles. 3) Spray a WD40 type product all over sprocket, and the holes. 4) Let soak a few days, respraying often. 5) Drive the machine with out the axle pins or bolts. This will use the machines own power to loosen the sprockets. 6) As the sprocket brake loose do not reinstall that pin or bolt, this will force the other axles more. 7) Continue to drive untill all are loose. 8) Replace ALL bearings at same time. 9) BE SURE TO USE ANTI-SEIZE upon reassemble, Do not get this product on the bearings or locking collars. Remember: There are no easy answers to broken AATV sprocket bolts. 1. 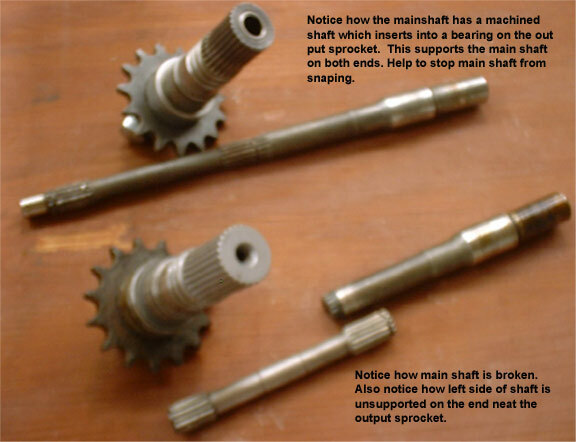 Bolt shank must be in contact with axle & sprockets not just the threads. 3. Do not drill oversize as it weakens axle. 4. Axles must be true, not bent. If any of the above items are not correct then bolts will break all the time. If you have working on an old AATV, then chances are good that you will have stuck parts. the bolt with a new one coated with anti-sieze compound. ,heat the race,not the shaft. 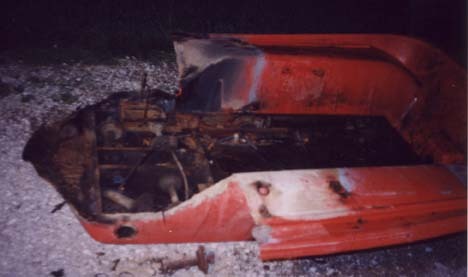 Never heat a part to the point of getting it cherry red. As this will render it useless. Also be careful around fuel,oil or plastic. And remember the parts will be HOT. crankshaft and strike with a hammer to loosen the flywheel. air powered AIR CHISEL will make this work much easier. looks like a tapered screw with backward threads and the other is a square tapered punch with sharp sides. the tool in the hole and CAREFULLY try to back it out. If it still won't budge we go to the last and most drastic step. BE CAREFUL NOT TO BREAK THE EASY OUT OFF. as close to centered as possible to help guide the drill. Good Luck and may The ATV gods be with you. The Borg Warner T-20 Transmission is an excellent unit but can be very hard to shift from Forward, Neutral, Reverse. to shift. The MAX IV machine with its many changes in direction of the shifting rods seem to be one of the worst. pressure untill the T-20 shifters "drop" or slide into place. These two general PHOTOS show this modification.